Between America’s coffee craze and the new onslaught of energy drink options, caffeine has become a consumption staple over the past two decades. New research suggests that our love affair with caffeine is starting earlier, and increasing at a more rapid, somewhat unsettling rate. The study published this week in Pediatrics showed caffeine consumption in over 73% of children starting as early as age 2 and increasing steadily into adulthood. “The American Academy of Pediatrics discourages the consumption of caffeine and other stimulants by children and adolescents. We need to continue to look at what are acceptable levels,” said Michael R. Taylor, deputy commissioner for foods and veterinary medicine at FDA, in a recent interview. The analysis went on for about a decade from 1999-2010, and while not being a common threat to children, the current growth of energy drink popularity has definitely created a surge in adolescents and adults in recent years. With no market presence in the earlier years of the study, in 2010, over 10% of caffeine intake for young adults aged 19-22 came from energy drinks. 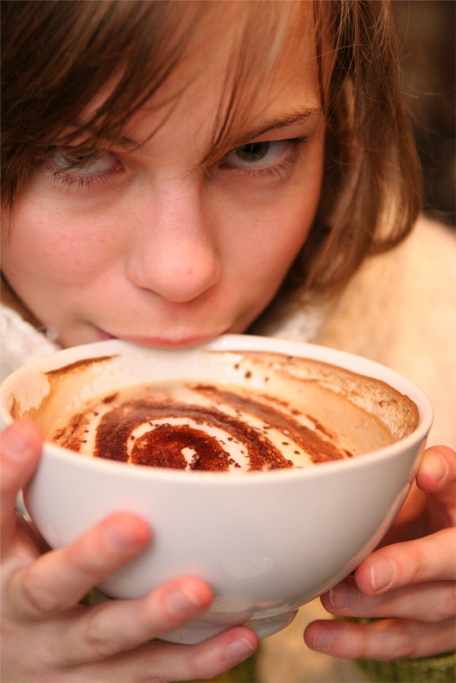 The dangers associated with early and increased caffeine intake are not to be ignored. In the study, caffeine consumption is linked to increased heart rate, blood pressure and anxiety. With a steady decrease in soda being the common source, the study finds coffee and energy drinks, which are often marketed to children, as the new leading avenues to the drug. As research continues to find no evidence that caffeine promotes health, the food industry is not holding back on its promotion of caffeine-injected products. “Wired” breakfast products such as instant oatmeal and waffles, which are manufactured with caffeine and marketed to kids are also serving as culprits to a child’s early dependence. “The proliferation of these products in the marketplace is very disturbing to us,” added Taylor.